This document discusses the Function Ontology, a way to semantically declare and describe function. It uses SKOS to define relations between functions, problems, and algorithms. There exist many specifications that define Web services, both non-semantically (e.g., WSDL and WADL) and semantically (e.g., OWL-S and Hydra) These specifications target different facets (e.g., HTTP-based vs SOAP-based access, defining RESTful APIs, etc. ), but have in common that they define Web services. Thus, they clearly specify, e.g., which HTTP method to invoke with which parameter to correctly call the Web service. The big drawback of these specifications is thus that they are very coupled with the technology stack. However, not all actions can be executed using Web APIs, either because of performance or practicality reasons. For example, the nurse call system is a near real-time system, which implies that unnecessary HTTP connections should be avoided. In this specification, we present a more general vocabulary as a data model, specification, and ontology to semantically declare and describe functions. Instead of defining technology-specifics, the functions are described independent of the technology that implements them. By semantically defining these functions using an ontology, we provide a uniform and unambiguous solution, and thus, we can close the gap between semantic data and any real-world action, and enable semantic applications to be used in real-world scenarios. This is an early draft, expect this document to change much and often. Applications built on top of Linked Data and the Semantic Web are emerging as a novel solution in many different areas, such as -- among others -- decision making and route planning. However, to connect results of these solutions (i.e., the semantic data) with real-world applications, we need a generic way to connect actionable events to semantic data. This specification (and accompanying ontology) explains how to semantically declare and describe functions, their input parameters, and possible outputs. A function declaration is stating that a function exists, without further ado. For example, function sum is a function declaration. A function description describes the function, i.e., talks about the inputs and outputs of the function. For example, the function above can have the following description: function int sum(int a, int b), namely, the function sum has two input parameters, int a and int b, and returns an integer. An assignment fills in the values of the parameters of a functions. For example, a possible assignment for the exemplary function could be sum(2, 4), namely, assigning the values 2 to a and 4 to b. A function is an actionable thing that can have input parameters, output, solve certain problems, and implement certain algorithms. A problem is problem that can be solved by executing a certain function. For example, the above function solves the doing a sum problem. An algorithm is a specified set of instructions, independent of its implementation (e.g., Dijkstra's shortest path algorithm). A function can implement one single algorithm, or use a combination of multiple algorithms to solve a certain problem. A function does not have to implement any algorithm or have to be mapped one-on-one to an algorithm. A parameter is the description of the input value of a function. For example, the above function has two parameters, a and b. An execution is the assignment of the values of the parameters of a function. An execution has as result the value of the output of the function. For example, sum(2, 4) is an execution of the example function. The value of the output is known after the function is executed, and should in this case be the integer 6. An implementation defines the internal workings of one or more functions. This depends on the used development context, i.e., the used programming language and execution environment. An implementation could be, e.g., an NPM package. A mapping links functions and implementations. The Function Ontology distinguishes between the (abstract) function and the (concrete) implementation. The two can be used together, but are complementary. The Function Ontology follows the Content Ontology Design Pattern and consists of a couple of base classes that need to be instantiated for real world use cases. Input parameters and output values are connected to functions via executions, using a reification paradigm. To be consistent with the paradigms used in SKOS, axioms need to be made instead of subclassing the base classes of the Function Ontology. The reification paradigm allows to define the connection between an execution and the input parameters and output values. This allows for re-use of these connection definitions, and more meaningful connections between input parameter and execution. No cardinalities are defined in the Function Ontology, as there are no hard limits on cardinality to be defined. A function can implement multiple algorithms, solve multiple problems, and have multiple executions. All executions can have multiple input parameters and output values. Vice versa, input parameters and output values can be linked to multiple executions, and an execution (i.e., a set of input values and output values) can be linked to multiple functions. skos terms can be used to relate problems with each other. This can also be done for algorithms and functions. fno:expects ( ex:intParameterA ex:intParameterB ). This description actually defines which predicates to use when binding the values to the execution of the function (using the fno:predicate predicate). All predicates are allowed, except for rdf:type and fno:executes. In the example ex:intParameterA and ex:intParameterB can be reused across function descriptions. As they only describe the parameters, and not the actual values, they can be reused. For example, the function function match(str, regex) and function split(str, regex) could reuse the same parameter instantiatons. The fno:expects has as range an rdf:List. This could be used to hint applications how many parameters are used, and in what order, however, this is not enforced. This to accommodate technologies where the order of parameters is not of importance. The range of the predicates used by the parameters don't have to be defined. However, by do defining them, we achieve type hinting. As can be seen here, are the predicates used as described as parameters of the function. 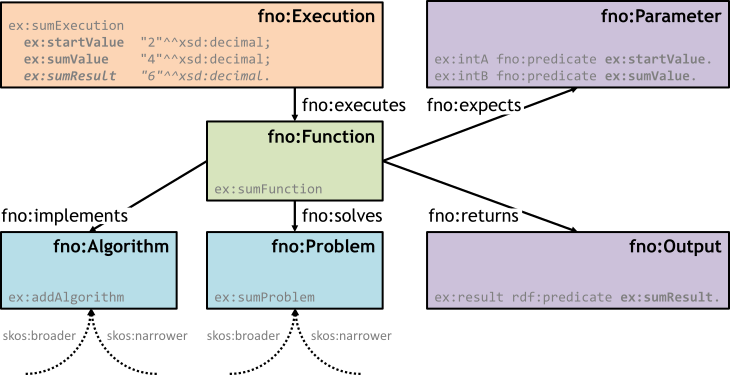 rdf:type and fno:executes cannot be used as parameter predicates, as this would conflict with the description of the execution. Similarly as with the parameter descriptions, the output descriptions can be reused across functions. The Hydra specification defines Web services semantically. A hydra:ApiDocumentation can thus be seen as a fno:Implementation. A fno:Mapping maps a fno:Function to a (part) of an fno:Implementation. For example: a left-pad function is mapped to a specific method in an NPM package. This requires the combination of 2 types of mappings: the mapping of the method name (so that, e.g., a ex:leftPad function is mapped to method doLeftPadding(), and the mapping of the parameters (so that, e.g., the argument with predicate ex:inputString of the function is mapped to the second parameter of the doLeftPadding() method. To link to the function and implementation, predicates fno:function and fno:implementation are used, respectively. Note that the actual implementations and mappings are not part of the Function Ontology. Specific development contexts can be further catered to. Maps the method name. For source code, this can be done using a fni:StringMethodMapping. The method name is an attribute of a fni:StringMethodMapping, linked using the fni:method-name predicate. Maps the different parameters. For source code, this is typically specified by the position, using fni:PositionParameterMapping: each fno:ParameterMapping gets linked to a parameter using the fni:functionParameter predicate, and to a position using the fni:implementationParameterPosition predicate. For a Web service, this is typically specified by a name, e.g., a POST using property "password" in the form body. A fni:PropertyParameterMapping is used. Each fno:ParameterMapping gets linked to a parameter using the fni:functionParameter predicate, and to a property using the fni:implementationProperty predicate. fno:returns ( ex:outputStringOutput ) . The following sections are a set of FAQs and How-to's regarding the Function Ontology. ex:searchValues ("Paris" "Brussels" "Tokyo" "Los Angeles") . Output can be assigned required or not. For example, thrown errors are an example of optional output.